Samurai Wars is a line that is set in feudal Japan in a era of clan rivalries as the emerging Emperor of Japan struggles to maintain control in a land honor and war. The line was heavily influenced by samurai films of 1950’s Japan that were made by many directors including Akira Kurosawa. Kurosawa’s Hidden Fortress is a major influence of Star Wars. Chipao is the loyal head servant of the Oganata Clan. Sotu-Mu Bushi are the huge groups of armored samurai that control the provinces and enforce the Shogun’s law. Princess Layu Oganata is the daughter of a wealthy daimyo (landed noble) who has been taken hostage for his attempts to start an uprising against the shogun. Daku Joutei is the ruthless shogun who serves at the behest of the Emperor of Japan. His iron law brings order in his twisted attempt to maintain stability at any cost. Sora Hokosusha is the adopted son of peasant rice farmers. He longs for adventure out of the damp rice paddies. Once a proud samurai, Obu Wankabe now wanders the provinces as a ronin, or masterless samurai. Chikushou is a frightening oni demon who serves his master Han Dokuen. Han and Dokuen is a merchant, pirate, and junk captain who had hangs around the port city of Nagasaki (the only port that allowed trade with the west) and as a result has been somewhat westernized. Fetababa is a cunning ninja who serves the shogun to eliminate the natural enemy of the ninja…the samurai. The following is a fake write up that I did for a convention. Ironically it got picked up and rerun on a few movie news websites. I felt a little like Orson Welles that day. Last year you may recall reading or hearing about a discovery that shook the cinematic world to its foundations. The famed Ekafama Auction House in Yokahama announced its astonishing discovery, pictures. However, these were no ordinary pictures, they were in fact stills from a movie a half a century old that was not supposed to exist. The film was a movie that even the most wishful cinephile thought was an urban legend. The movie was Mononofu Woza: Ryu-Mikomi by acclaimed Japanese director Akira Kurosawa. Very little has been written about the film over the years as very little was known. The facts are hard to come by as the story and legends surrounding it grew substantially over the years until the entire project entered an ethereal state. The facts that can be confirmed by the limited studio records that survive are few. It was to be something of mega project unheard of in its day. 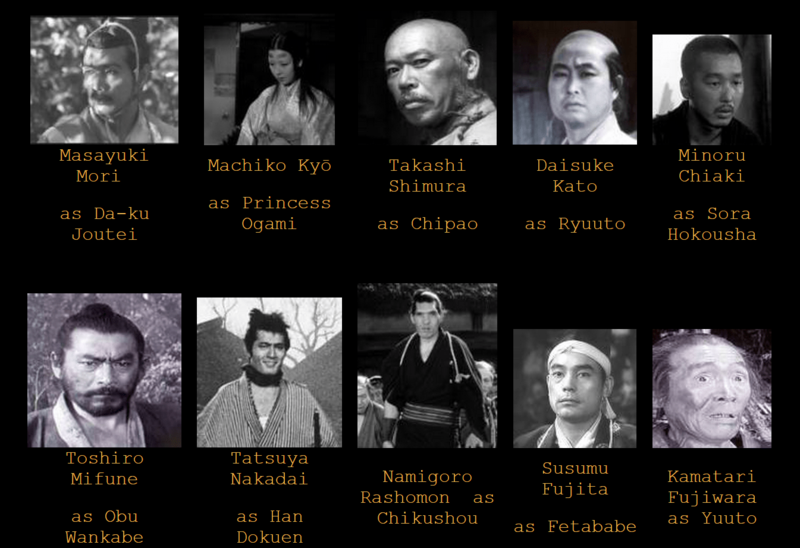 The film was budgeted to be the most expensive film in Japanese history and boasted a veritable who’s who of Japanese cinema and Kurosawa regulars (see inset table below). It began filming in 1955 and would have been released the following year in 1956. Most of the principal photography had wrapped when tragedy struck. A fire broke out in the offices at the famed Toho Studios. The arson investigation ruled newly installed faulty wiring as the cause of the blaze. The studio decided the project could not be restarted due to the numerous commitments of its many stars to other films, many of which Toho studios was also overseeing. The decision to cancel the production over was always a great sadness for Kurosawa. Many of the sets and plot details were reused a few years later in another Kurosawa film, The Hidden Fortress. However, in respect for the work he had already completed as a unique creation much of the film was changed and scaled down for the second attempt. The plot, according to those involved in the production, was epic. The film was set during the feudal era of Japanese history that preceded a unified country with a shogun and Emperor. The story followed the rise in power of warlord daimyo, Da-ku Joutei, as he struggled to bring all of Japan under his control. In a final attempt to take power from the final clan that stood in his way, he took Ogami, the daughter of their leader, hostage. She was in secret negotiations with a few small bands of rebellious groups to unify against Da-ku while there was time. Just as she was being captured she dispatched two of her servants the overly prudish Chipao and the trustworthy Ryuuto. Their mission was to find an aged ronin, a masterless samurai, named Obu Wankabe, for only he could complete the mission with which she was tasked. Lost and on a hopeless quest the servants befriend Sora Hokousha, a wide-eyed peasant, who jumps at the chance for a little adventure. With Sora’s help the two find Obu and continue their mission. The major problem is that Da-ku’s fortress is on a remote island cutoff and protected from invasion. In a ruthless sake tavern, the band hires Han Dokuen a westernized sailor and criminal who happened to be the only one in the establishment not currently employed by Da-ku. Once settling on a price, they group sets sail for the island on Dokuen’s ship with his first mate, Chikushou, a huge hairy oni, or demon, that Dokuen controls through a magic amulet. Word reaches Da-ku about the band and he dispatches Fetababe, a ninja and assassin, to eliminate the threat. On the voyage, Obu instructs the young Sora on the way of the samurai and the code of bushido. After some skirmishes with Da-ku’s troops and Fetababe the rescues assault the stronghold and rescue Ogami dealing a crucial blow to Da-ku’s plans and instilling the countryside with hope that they could still stop his takeover. 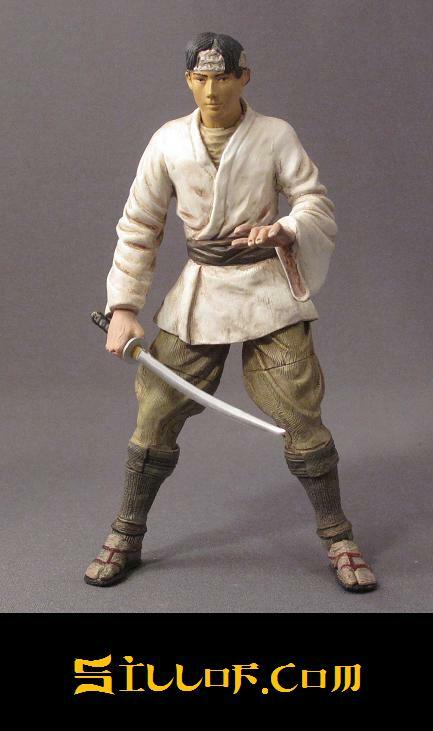 Next fall a new line of action figures commissioned by the Kurosawa estate will hit stores. The 7” figures will be sculpted by Sillof Studios and come complete with accessories and bases. The line will contain all of the characters in the inset table. The prototypes for the figures are below.